Action: Attach Tear Gas to a character. 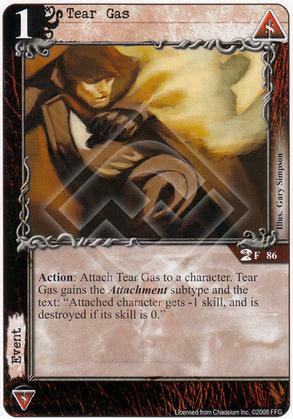 Tear Gas gains the Attachment subtype and the text: "Attached character gets -1 skill, and is destroyed if its skill is 0." The FAQ/Errata doesn't specify that cards with the Attachment subtype are also automatically support cards. So, whereas Expendable Muscle clearly defines it as a "Attachment support card," I'm left to assume that Tear Gas is NOT a support card even though it's an Attachment. This matters for support removal, but also for Wandering Tinker, who can only salvage support cards. Similarly, Mnomquah's Serpent doesn't count as a support card either, as it is only a "Curse attachment" (lower case "a"). Has anyone found anything to the contrary? I read the Attachment section of the FAQ, but I found nothing about this. Yes, my reading is consistent with yours. I had noticed this wrinkle before. When a card becomes attached to another card due to a card effect, that card is now considered a support card (regardless of its normal type) with the Attachment subtype.